Interviews with Canadian culture shapers, ministry tips, articles read aloud, and more, hosted by senior editor Karen Stiller. Meaningful 45-minute chats on social issues with Canadian experts, hosted by senior editor Karen Stiller and our publisher, the EFC. What’s new this week? Find out! Printed copies delivered to your door—for less than buying them at a store. The Grace of Aging. The experience of growing old is as unique as we are. But what does the Bible really teach about it? This thoughtful essay is great for small groups, and comes with three discussion-starter questions at the end. Crisis Response. 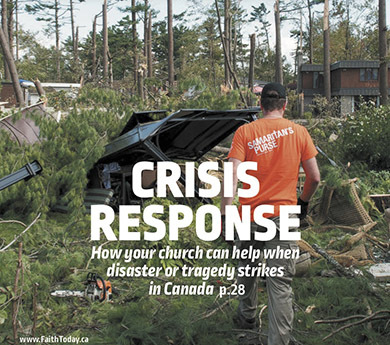 How your church can help when disaster or tragedy strikes in Canada. Sign up for our newsletter to receive the latest updates right to your inbox. Listen to a wide range of podcasts on topics that matter to you. 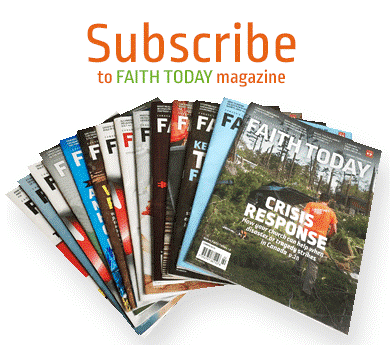 Download the Faith Today app and read our articles while on the go.